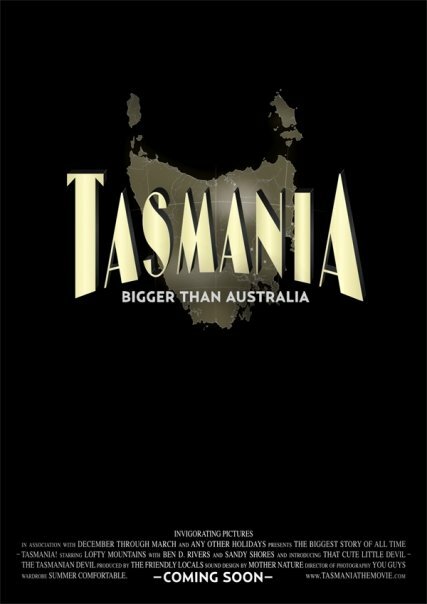 Tourism Tasmania is riding the back of Tourism Australia’s connection with the Australia movie, with a competing movie campaign, online at today’s site of the day, www.tasmaniathemovie.com. Earlier this year Tourism Australia invited the whole Australian tourism industry to get on-board with the launch of Baz Luhrman’s Australia and develop activities to support and complement Tourism Australia’s own marketing efforts around the movie. Tourism Australia rose to the challenge and came up with their own movie promotion, “Bigger Than Australia”, launched in the same fashion as a movie premiere, in newspapers, on television, in theatres, on the movie site and on Facebook. As audiences line up in theatres to see Australia, they are being greeted by posters for ‘Tasmania The Movie’ and then once in their seats by a spoof trailer. The microsite has all the features of a typical film launch, including director’s commentary (not serious), trailers, image galleries (serious) and how to visit Tasmania (very focused). The Bigger Than Australia campaign was developed at Leo Burnett Sydney by executive creative directors Jay Benjamin and Andy DiLallo, creative team Rupert Taylor, Dave Ladd, Corey Young, Andres Fabian, online team Jonathon Mo, Kieran Ots, Tip Gloria, account management team Peter Fitzhardinge, Jodi McLeod, Annabelle Morris, and strategist Kirsty Angus. The production team included Patrick Fileti, Rita Gagliardi and Dominic Locher.